Starting with a short rain shower, things dried up enough outside for sketching. 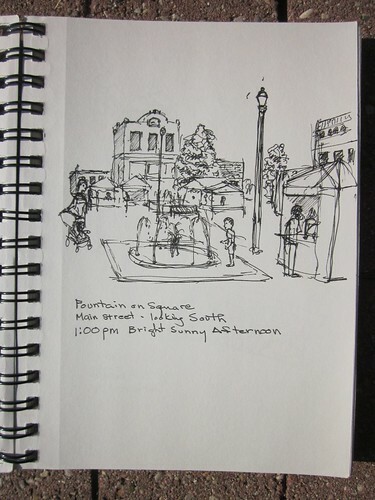 The Main Street Square Farmers Market was in full swing and this provided a lively place to start the day sketching. Children were playing in the center fountain, running through the water on this hot day. 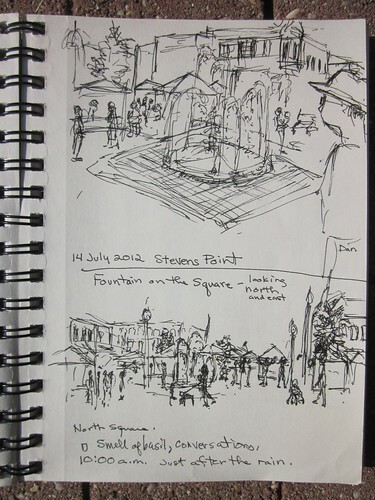 Although, I was a solo sketcher this time, I hope to get more people involved in the sketching next time. I had a little sign - "36th World Wide SketchCrawl" - out on my backpack noting what I was doing just in case some showed up who did not know me. The sign also let others know what I was doing and I enjoyed talking to several people who stopped by, especially Sally, Sheila, Gail, and Don. 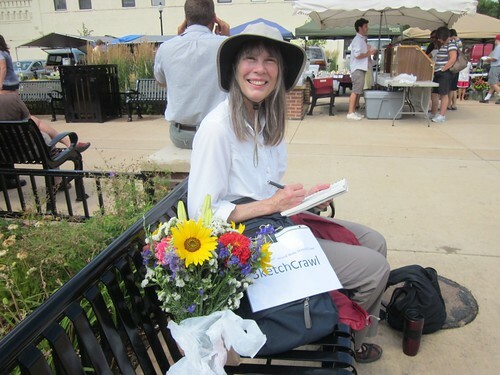 Thank you to Enrico and SketchCrawl organizers for making this event possible. 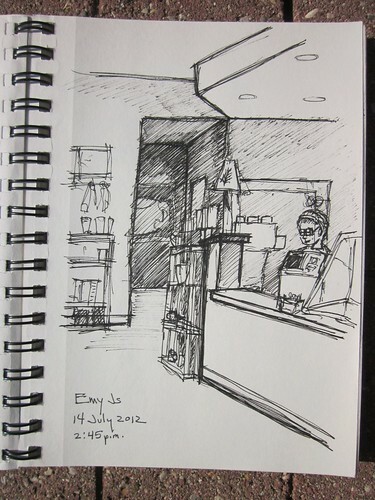 It is also great to see all of the sketching done across the world on July 14, 2012. It made it a special day for me, knowing I was not the only one on a sketching mission! 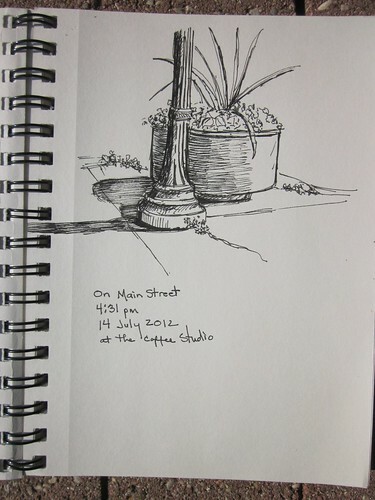 Side note: I hope these URL addresses work okay for posting sketches done downtown in Stevens Point, Wisconsin during the 36th World Wide SketchCrawl event day. This is my first time doing this, so I posted URLs for each sketch. I will try to figure out how to post the image. *******Ah! Thank You! Alissa! Your post below helped me to post my images and it changed the URLs into the images by adding your suggested additions to it. 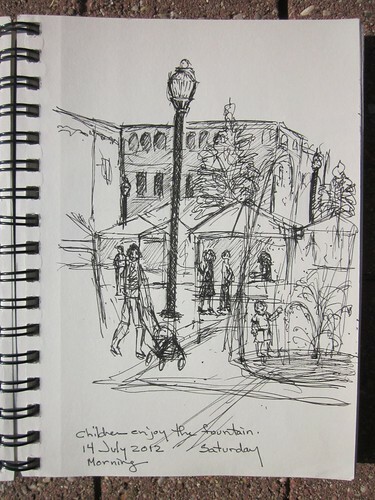 This first photograph is a view sitting in the square at the Farmer's Market starting the SketchCrawl for the day. 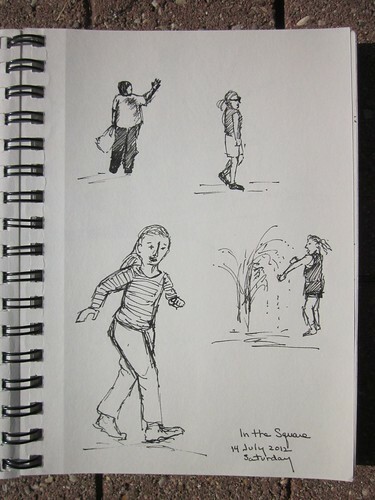 Morning and Afternoon Sketches - enjoying the hustle and bustle of the Saturday Morning Farmer's Market. Some Views are also from downtown Stevens Point, along Main Street, and in and out of the local coffee houses. 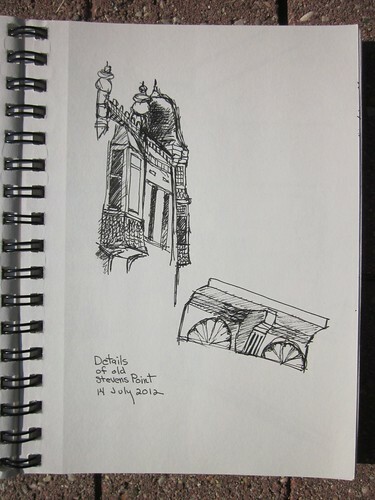 Afternoon Sketches - downtown Stevens Point, along Main Street, in and out of the local coffee houses. Last edited by kathejulin on Tue Jul 17, 2012 8:55 pm, edited 9 times in total. Great sketches ! You have captured the business of the makets and some lovely architectural detail. The sign on your backpack is a great idea. Unless you have a whole set of watercolours out in front of you , passerbys don't know what you are doing. Even when we have a group of people together, they usually disperse to sketch individually or in small groups. I think that you have almost get your images online - maybe just the [img]in%20front%20of%20the%20link%20and%20the[/img] after the link for each image. But I am a technology luddite, and think I have a major achievement uploading images, so I could be wrong. Thank you, Alissa, for your comments. I agree the sign helped. Next time I will bring my watercolors though. And I will try your suggestion on the posts again to show the image. Great ! - did people stop and ask about what you were doing? or quietly look over your shoulder? Yes, people did stop and ask about SketchCrawl and what I was up to. I had copied some pages off the web to show them that there were other cities across the world doing this too on the same day, and they thought that was a neat idea. I also think I found some recruits to do this with me next time. Thanks, again, Alissa! Great sketches!!! Doing the sketchcrawl with other people is fun, but I always have a good time if I do it by myself too. People never hesitate to come over and talk to you. I sketched at a farmers market too. Nice work! Thanks, Joan! I agree sketching alone is also fun. Doing things by oneself should never be a deterrent and shouldn't stop us from getting out and enjoying observing the world around us with sketching. It is a different type of sharing experience, with people who stop by to take a look and chat, and in the end we are not really alone. UWSP students, as you view this, be sure to consider joining us for the 37th World Wide Sketchcrawl on October 13!